A Daily Dose of Fit: Yesterday morning was very hard. There are some things in life you can prepare for, like a job interview or half marathon, but when it comes to accepting the inevitable death of your beloved family pooch—no amount of preparation makes it easy to say goodbye. Kylie joined our family 13 years ago. She was a gift given to my sister, though we all loved her equally. 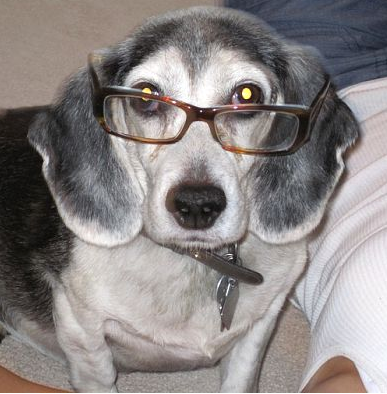 She was our beagie (beagle), and she loved us back with all of her heart. We could tell and it made us feel special, but then again, she loved everyone. Kids would jump on her, tug at her ears and pull her tail, but she never bit them. Not a single one. She suffered through many a pink pedicure, dog-ear pigtails with old hair scrunchies, smelly socks stuffed onto her snout, ribbons tied around her neck and so much more. All in the name of love, and never once did she complain. And she always, always greeted you at the door with a fast-waggin' tail and barks that seemed to say "I missed you so much it hurt." She was the four-legged sister, the furry daughter, and yesterday we said goodbye. Kylie spend the last few years of her life fighting a doggy disease we'll never really understand. Yesterday morning was the first time we ever truly saw her pain. We hoped an early trip to the vet would help her, but as it turned out, it was just time. Time to say goodbye. Time to send her off to a special place above. She was ready, even though we weren't. But again, there are just some things you really can't prepare for. We stayed with her at the vet's office until the very end, some of us holding her while others waited outside the room. (Oddly enough, we were all in town at the same time.) She was just a dog, but she was our dog and we couldn't leave her alone. She, after all, wouldn't ever leave us alone if she knew something was wrong. She'd be by our side, or sitting right outside our bedroom door. So we did the same for her. Kylie's "livin' the good life" pillow might stay in the corner of the living room at my parents' house for a while, and over time we'll get used to the idea that she won't be sleeping on it anymore. Or greeting us at the door when we get there. These things do, after all, take time. Despite her disease and all that it did to her, Kylie never stopped (looking for crumbs, begging for scraps, following us around). But now that she had, it was time for us to move forward with all of the memories she gave us. So, in honor of our precious puppas, we decided to go about our day. Dad and I went for a bike ride—yet another reason why yesterday morning was really hard! 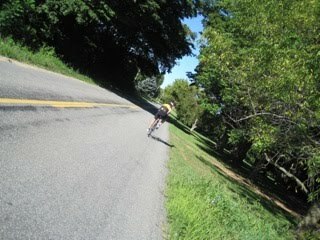 We pedaled almost 20 miles along a route that included one of the biggest hills I've ever conquered (barely) on two wheels. It felt good to get some fresh air. And sometimes, that's what fitness is for. There's something about testing your muscles—maybe it's all that seratonin—that can bring a smile to your face. Think about the last time you saw a dog running around the backyard, full speed ahead, big ears flopping in the wind. You'd swear they were smiling, right? Maybe it was just Kylie. Rest in peace, Snooks. We'll love you forever. So sorry, Tara. She was the sweetest dog! She definitely lived the good life.